I am delighted to post pictures from some of our oldest codices depicting the writing of Lemarbe as it appears in Sefer Yishaya 9:6. This first picture is from the Keter Aram Tzova (Aleppo Codex). It was written by the Sofer Shelomo Ben Bo'oya under the direction of Aharon Ben Asher in Tiberia in the 10th Century. This Codex was our oldest extant manuscript of the entire Tanach + Masoretic notes including punctuation and Ta'amei HaMikra. As mentioned in my previous post, it is also the most authoritative due to it's proven exactness. Notice how Lemarbe is written in two words, with the MEM SOFIT placed at the end of the first "word." 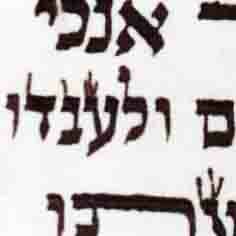 Likewise, notice the masoretic note indicating that it should be pronounced as one word... i.e. Lemarbe. In it you will also notice other strange things with regard to how they used to write Ketav Ashurit in 10th Century Tiberia. Notice the length of the YOD. Although we would invalidate it today; then, this was deemed as standard and proper. More so, notice that it was also usual for the inner legs of the HEI and KOF to be joined at the roof. Other details include the lack of tagin, the long upward elongated LAMEDS with short feet and no base, among many others. In essence, our modern dfinition of Ketav Ashurith has changed somewhat from the standard practice of sofrim in the 10th Century. This second picture is of the Leningrad Codex. The Codex was completed at the beginning of the 11th Century in what today is Cairo Egypt. Both, its text and punctuation are patterned against the Ben Asher family tradition but it is not as precise as the Aleppo Codex. Some of the same characteristics in the shape of the letters exhibited above are also observable in this script. Notice that in the Leningrad Codex Lemarbe is written as one word with the MEM SOFIT appearing in its middle. Likewise, the same masoretic note appears with the instruction for us to read as one word. As we can see, these variances have existed in our tradition for a very long time. What is even more incredible, is that we have been perpetuating these differences until today. For us, it is truly an oddity to see a MEM Sofit in the middle of a word. 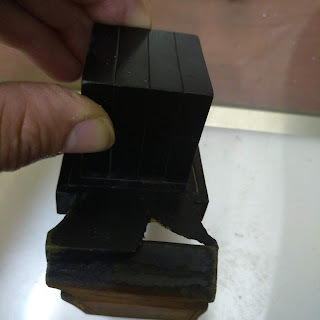 However, after viewing the Keter Aram Tzova and how tradition had it split in two separate words, we can now begin to understand that the MEM SOFIT was placed there in order to signal in a clear and decisive way that tradition required this one particular word to be split in two. Alberto thanks for the beautiful and most interesting post, your notes are very appreciated. I agree with you that this was probably the csav ashuris customed in the middle-east 1000 years ago, it resembles a lot the ctav ashurit of spain that we have examples of. But this is not a definite say on what ctav ashurit was in their time, since this is a tanach/chumash or what is later called the csiva of machzorim, a common script scribes wrote for hebrew manuscripts, other than sefer tora or kosher nvi'im. Thanks for posting this! The pictures and your comments. Is there anything more you could say about the Leningrad Codex? If I'm not bothering you too much, could you please post both pictures without the circles (you can edit the post and add them in)? When I print it it bothers a little too look at it with the circles. If you click on them, they will automatically enlarge on your screen allowing you to view them if greater detail. If it doesn't work, don't be shy and please let me know. I'll be happy to make new pictures. Yes, that is ONE of the original features that distinguished the HEI from the CHET. The HEI always had the left foot within the roof. By the CHET, however, the left foot was always placed at the very edge of the roof. Enlarging them helps but I'd like to print them as well. When looking at a print out even if it's big still the circles can bother. Thanks! OK. I will email them to you. Nice post. I would add Rabbi Breuer as a reference for more information. He put together some 5 of the most accurate codices we have at hands and after his research the Aleppo and Leningrad came out as the most precise. 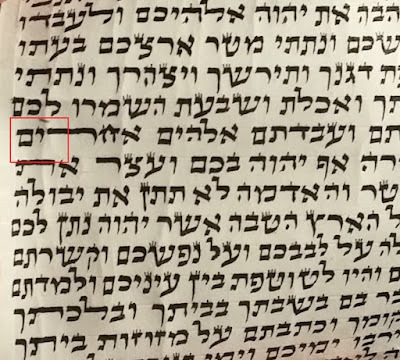 Also, there is a Mesora in the Aleppo community that the Aleppo codex was the one used by the Rambam when he wrote his sefer torah.